I have been a driving instructor for more years than I care to remember and have always had a total enjoyment of driving. I have built up a varied range of motoring experiences over the years including driving cars, lorries, buses, motorbikes and campervans (My 20 year old campervan definitely brings her own driving challenges!!). My love of driving led me to make a career out of supporting others as they worked towards the freedom and enjoyment that passing your driving test brings. 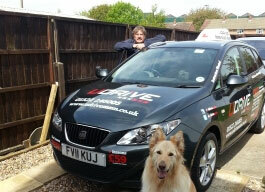 I built up my own driving school in Yorkshire which I ran for many years before moving to Lincoln where I worked for a National company for a number of years before joining Udrive. During my time as a driving instructor I have enjoyed helping hundreds possibly thousands of people to pass their test and have taught people from 17 -65 years of age. I joined Udrive as the company has a very professional and caring approach which centres around the needs of the learner. My own approach to supporting others as they take the tentative steps towards becoming a driver matches these ideals. I always strive to build a teaching program which is tailored to your individual needs and allows you to make quick progress in a supportive, safe and humour filled environment. So make the right decision today and begin your journey towards becoming a safe and confident driver by giving me a call.